The idea to connect everything to anything and at any point of time is what vaguely defines the concept of the Internet of Things (IoT). The IoT is not only about providing connectivity but also facilitating interaction among these connected things. Though the term IoT was introduced in 1999 but has drawn significant attention during the past few years, the pace at which new devices are being integrated into the system will profoundly impact the world in a good way but also poses some severe queries about security and privacy. IoT in its current form is susceptible to a multitudinous set of attacks. One of the most significant concerns of IoT is to provide security assurance for the data exchange because data is vulnerable to some attacks by the attackers at each layer of IoT. The IoT has a layered structure where each layer provides a service. The security needs vary from layer to layer as each layer serves a different purpose. 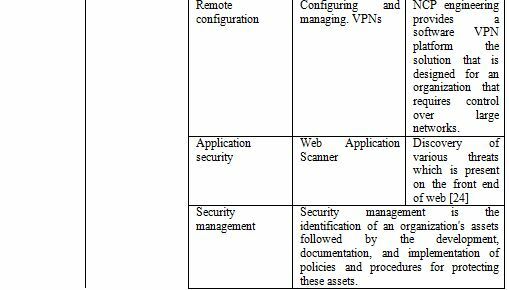 This paper aims to analyze the various security and privacy threats related to IoT. Some attacks have been discussed along with some existing and proposed countermeasures. Internet of Things, privacy, attacks, security, threats, protocols. Kevin Ashton in 1999 coined the term ‘Internet-of-Things (IoT)’  and was primarily used to describe how IoT can be created by “adding radiofrequency identification and other sensors to everyday objects.” Today the term IoT encompasses a set of heterogeneous devices that are connected via some communication protocols and sensors, which enable us to locate, identify and operate upon these devices. The ‘things’ in IoT are the entities that are involved in communication among themselves and with the environment in which they exist and are responsible for generating large amounts of data and information. For making physical or virtual connections, it uses objects like sensors, actuators,etc. The success of IoT infrastructure and applications depends on IoT security. The IoT collects the data from a vast geographical region using sensors . The Cisco Internet Business Solutions Group (IBSG) has come up with a ballpark figure of 50 billion IoT devices by 2020,and the rationale for this massive number is the numerous and attractive services provided by IoT. Communication protocols that played a vital role in the emergence of IoT include Wireless Sensor Networks (WSN), Radio-Frequency Identification (RFID), Internet protocols and mobile communications. The concept of IoT devices is not onlyabout providing connectivity but also interaction among themselves. The need of the hour is that they should deploy context-based interactions . There will be billions of devices interacting among each other over the internet, that will surely open doors for hackers, and with that, there will be a lot many security threats that will need immediate supervisions. In the IoT infrastructure, the sensors and objects are integrated for communications that can work successfully without human interventions. The sensors play an essential role in the IoT as these are devices that not only collect heterogeneous data but also monitor it . The security issues like privacy, authorization, verification, access control, system configuration, information storage, and management are the real challenges of the IoT infrastructure . Undoubtedly, to make IoT a reality, the security issues need to be resolved. IoT is the future generation internet. The two types of challenges that we need to focus on are technological and security challenges. The Application Layer: The main aim of the application layer is to provide services to its users. The Network Layer: The layer that is most prone to attacks is the network layer as it aggregates data from existing infrastructures and it transmits that data to other layers. The primary security issues are related to the authentication and integrity of data that is being transmitted . The Perception Layer: The lowest layer of the IoT architecture and also the brain of the three-layered architecture. It is the physical layer.The sensing devices like the sensors are present on this layer. It is also known as sensors layer . Table 2. 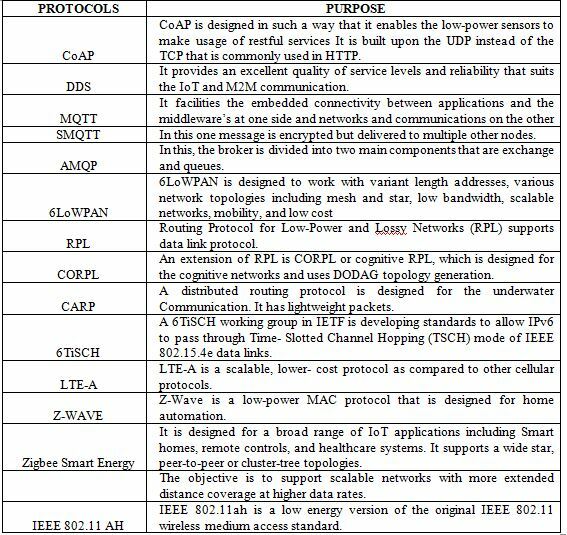 Application, network and perception layer protocols [11-23]. The security and privacy issues have emerged as one of the primary concern in IoT implementation. Fig. 1 shows the web search of these terms measured by Google search trends since Jan 2004. It is clear that since 2014, search volume is increasing for both the terms primarily because of the large scale integration of IoT devices during last five years and increasing concern among the users about the confidentiality and privacy of their information contained in the systemWhile as Privacy includes the concealment of personal information as well as the ability to control what happens with this information , IoT security is concerned with safeguarding “things” in the Internet of things. IoT systems are prone to security attacks for a variety of reasons including the wireless communication between devices, physical access to objects, the constrained capacity of smart devices and openness of the system .Broken devices or permanent failures of such devices provide vulnerabilities and can,therefore be exploited by potential attackers. A typical example of such devices can be RFID tags. Figure 1. Google search trends since 2004 for terms IOT Security, IOT Privacy [11-23]. What makes privacy an essential IoT requirement lies in the anticipated IoT application domains and the technologies used. IoT adoption is harnessed due to lack of adequate measures for ensuring the privacy of information in variant IoT application fields like patient’s remote monitoring, energy consumption control, traffic control, smart parking system, inventory management, and production chain,etc. . Additionally, the adoption of wireless communication medium for data exchange can lead to a potential risk of privacy violation as exchanges over such medium can expose the underlying system to multiple attacks. Under these circumstances, security and privacy represent a real research challenge that may restrict IoT development. In an attempt to address these security and privacy concerns, we need to provide strict measures to protect data and tackle privacy risks. The underlying security properties that need to be implemented are confidentiality, authenticity, integrity and availability. 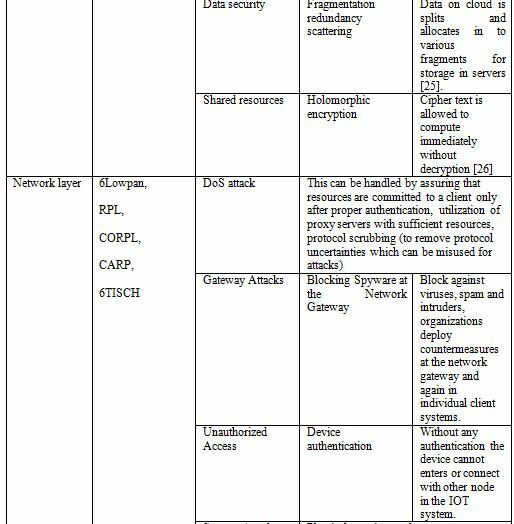 Some other security requirements are derivedsuch as scale, IP Protocol-Based IoT, Heterogeneous IoTand Lightweight Security. The Internet of things offers many applications that are of substantial value to the user but at the same time can expose the user to unprecedented security threats and challenges. Much of this threat comes from the fact that the devices connected in an IoT network share some level of trust and exchange information without performing any malware tests. 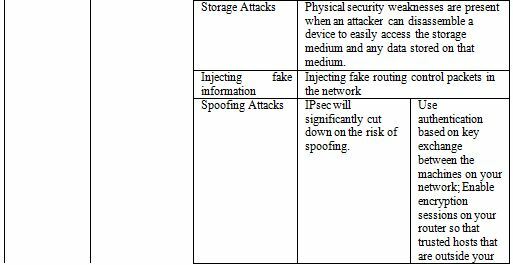 The threats can broadly be classified into three categories. The categories are capture, disrupt and manipulate. The capture threat means capturing information or system without authorization. The capture threats are such threats that are designed to gain access to information that is either logical or physical on a network. The disrupt threat means denying access or destroying a system.The manipulate threat means manipulating time series data or identity. Multiple security vulnerabilities exist in the current system with the potential to result in security concerns including Insecure network services and software/firmware, lack of transport encryption, insecure cloud and mobile interface, insufficient security configurability and poor physical security, insufficient authorization/authentication, insecure web services and privacy concerns . 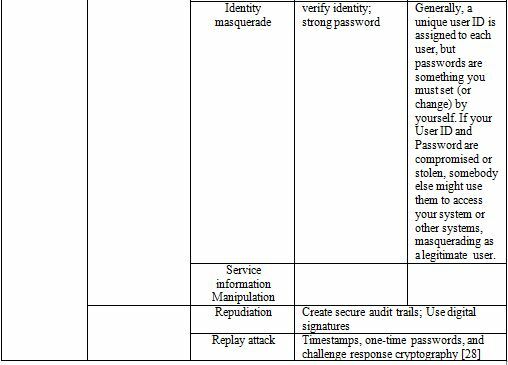 The countermeasures that can be taken are the authentication measures, the establishment of trust and acceptance of federated architecture awareness of security issues. The field of IoT is still considered to be in its nascent stage and the technologies employed have considerable scope to progress. Security and privacy pose a very serious challenge to the researches and hinders the growth of IoT. Due to the fact that IoT is an emerging technology, attackers take advantage of the underlying potential to threaten theuser’s privacy, security using wide variety of attacks. 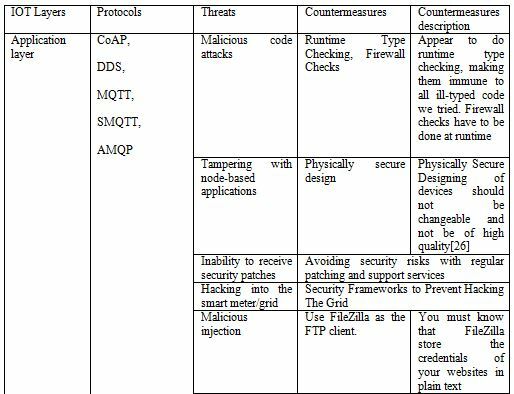 This paper presents the comprehensive overview of security threats and attacks on IoT. Countermeasures of the security threats and attacks deliberated with the detail description. The future work involves finding alternative solutions for attacks that are less complex and less time consuming. The future research involves development of protocols and find ways to overcome security threats and attacks. The IoT is developing at a very rapid pace, and successful growth of IoT is only possible ifwe address the security and privacy challenges related to the internet of things. A secure IoT paradigm is possible only with the redressal of issues like 5g protocols, key and identity management, fault tolerance, trust &amp; group management and end-to-end security. 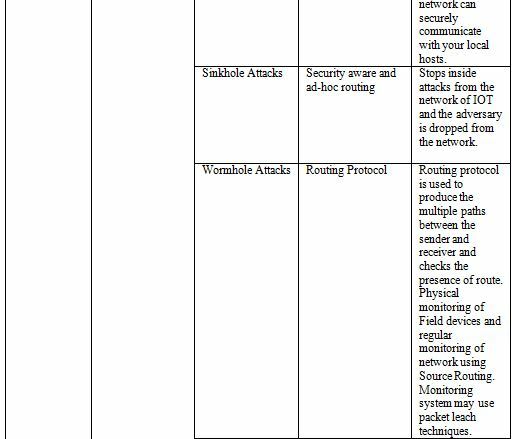 As highlighted in this paper, work needs to done in the areas of IoT architecture, finding alternative solutions for attacks that are less complex in terms of time and other resources. Moreover, policies need to be devised concerning regulations, trust management, legal framework, and device security at the manufacturer’s end. J. Gubbi, R. Buyya, S. Marusic, M. Palaniswami, Internet of things (IoT): a vision, architectural elements, and future directions, Future Gener. Comput. Syst. 29 (7) (2013) 1645–1660. Roman, R., Najera, P., Lopez, J., 2011. Securing the internet of things. Computer 44 (9), 51_58. Whitmore, A., Agarwal, A., and Da Xu, L. (2014). The Internet of Things: A survey of topics and trends. Information Systems Frontiers, 17(2), 261– 274. Aazam, M., St-Hilaire, M., Lung, C.-H., and Lambadaris, I. (2016). PRE-Fog: IoT trace based probabilistic resource estimation at Fog. 2016 13th IEEE Annual Consumer Communications and Networking Conference (CCNC), 12– 17. Jiang, H., Shen, F., Chen, S., Li, K. C., and Jeong, Y. S. (2015). A secure and scalable storage system for aggregate data in IoT. Future Generation Computer Systems, 49, 133– 141. Li, S., Tryfonas, T., and Li, H. (2016). The Internet of Things: a security point of view. Internet Research, 26(2), 337– 359. A. Al-Fuqaha, M. Guizani, M. Mohammadi, M. Aledhari, and M. Ayyash. Internet of things: A survey on enabling technologies, protocols, and applications. IEEE Communications Surveys Tutorials, 17(4):2347–2376, Fourth quarter 2015. Pongle, P., and Chavan, G. (2015). A survey: Attacks on RPL and 6LoWPAN in IoT. 2015 International Conference on Pervasive Computing: Advance Communication Technology and Application for Society, ICPC 2015, 0(c), 0–5. Tsai, C.-W., Lai, C.-F., and Vasilakos, A. V. (2014). Future Internet of Things: open issues and challenges. Wireless Networks, 20(8), 2201–2217. M. Singh, M. Rajan, V. Shivraj, and P. Balamuralidhar, “Secure MQTT for the Internet of Things (IoT),” in Fifth International Conference on Communication Systems and Network Technologies (CSNT 2015), April 2015, pp. 746-751. Zhang, Zhi-Kai, et al. ”IoT security: ongoing challenges and research opportunities.” Service-Oriented Computing and Applications (SOCA), 2014 IEEE 7th International Conference on. IEEE, 2014. D. Migault, D. Palomares, E. Herbert, W. You, G. Ganne, G. Arfaoui, and M. Laurent, “E2E: An Optimized IPsec Architecture for Secure And Fast Offload,” in Seventh International Conference on Availability, Reliability and Security E2E: 2012. Abomhara, Mohamed, and Geir M. Køien. 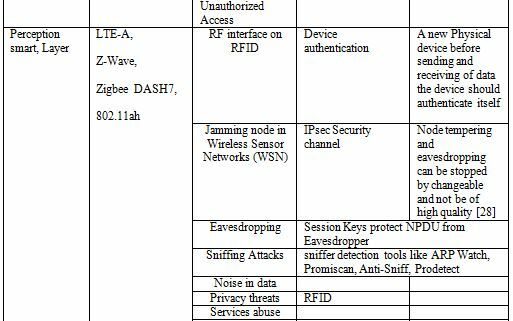 ”Security and privacy in the Internet of Things: Current status and open issues.” Privacy and Security in Mobile Systems (PRISMS), 2014 International Conference on. IEEE, 2014. B. L. Suto, “Analyzing the Accuracy and Time Costs of Web Application Security Scanners,” San Fr., no. October 2007, 2010. 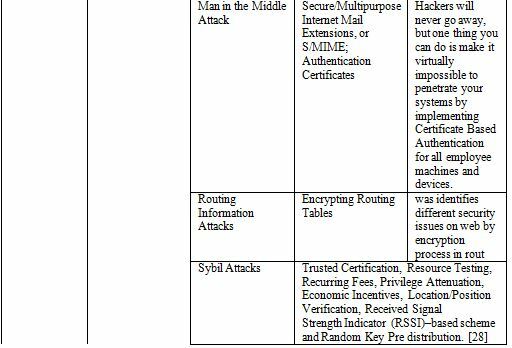 O. El Mouaatamid, M. LahmerInternet of Things security: layered classification of attacks and possible countermeasures Electron J (9) (2016). Sicari, Sabrina, et al. “Security, privacy and trust in the Internet of Things: The road ahead.” Computer Networks76 (2015): 146-164. Bokhari, Mohammad Ubaidullah, and Faheem Masoodi. 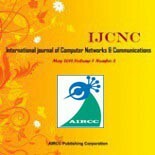 “Comparative analysis of structures and attacks on various stream ciphers.” Proceedings of the 4th National Conference. 2010.